The absolute Jewel of the exclusive lakeside Mallorca Community. This is a once in a lifetime opportunity. First time on the market in almost 30 years.This is the largest model with the absolute best Waterfront location. 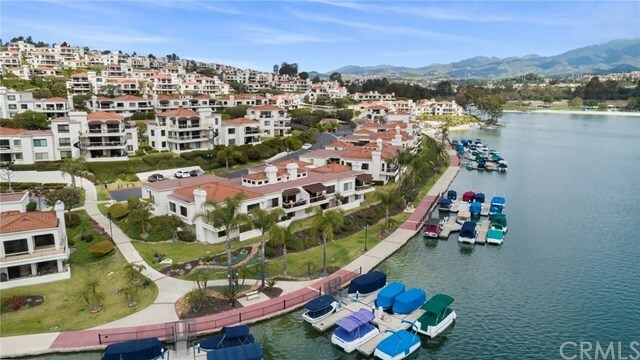 Incredible Unobstructed Panoramic Lake Views from almost every window and located at the end of a cul de sac with extra guest parking, lake access and private boat docks just steps away. Premium 3 bedroom 2.5 bath end-unit with a large open and airy floor plan. Enjoy single level living with Living Room, Dining Room, Kitchen, Powder Room and best of all the Master bedroom and bath all on the main level. The lower level has a very spacious Guest Bedroom and full bath and a double door entrance to the third bedroom/office with sliding door for full lake views. Enjoy all of what this special community has to offer with Lake Activities, Summer Concerts, Sandy Beach, Picnic/BBQ area and Pool and Spa. The Mallorca Community offers a 24/7 live gate attendant.